Can't decide what to get for the golfer in your life? 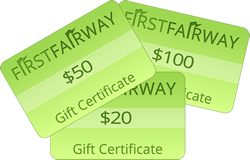 FirstFairway gift certificates are the perfect choice! Our completely electronic gift certificates arrive via email and are sure to bring a smile to the face of that special someone. You may purchase a Gift Certificate for any amount ($10.00 or over). When payment for your order is processed, your Gift Certificate is activated and is sent to the recipient via e-mail. Your Gift Certificate expires after 2 years.